I love this exchange, and I thought many of you would too. There has been quite a bit of interest about homeschooling science co-ops based on the number of hits the co-op blog posts on this site are getting. This is an email I received recently from someone who is teaching one. I have also included my reply. I just started teaching biology for my co-op out of your book (thanks for the notes on your blog on teaching it in a co-op btw), and I’ve had the kids watch the full program of BBC hidden universe, secret life of a cell https://www.youtube.com/watch?v=FFrKN7hJm64 which pretty much convinced the kids that viruses were alive, which meant that during the debate on whether viruses were alive or not, they decided that the definition of living was outdated and needed to be changed. The very big problem was chapter 2 – this week, right after I explained the difference between a scientific theory and non-scientific theories, we came to cell theory, and one of the students pointed out that if viruses are alive, cell “theory” isn’t true. Please help, I’m sure there is a good explanation I can give the kids, I just don’t know it. I’ve looked through a bunch of internet articles, and the consensus seems to be that a virus is definitely not a cell, and there may be a new classification of alive. I love this question and this debate. If scientists need to update the definition of living to include viruses, then the cell theory needs to be broadened to include viruses. Perhaps your student who feels strongly about this could rewrite it for the class, adding another element to the cell theory. Working scientific theories are updated often as new information or understandings come to light. This is actually the strength of scientific theories. Take Newton’s Law of Universal Gravitation into consideration. For centuries it was thought to be THE explanation for gravity everywhere in the universe until Einstein showed that Newton’s Law of Universal Gravitation only worked when the mass of the object is small (at least smaller than a planet), or the velocity (speed) the object is moving is low (so not at speeds close to the speed of light). The working scientific theory explaining gravity had to be rewritten and broadened to include these situations, large masses and speeds close to the speed of light, and is now called the Theory of Relativity. In case you are wondering I am not weighing in on the debate. But if the class decides the definition of what constitutes an organism needs to be updated to include viruses, than they are correct in thinking the cell theory needs to be updated too. If you are teaching a science co-op class and have something you want to share, e-mail me at blairleescience@gmail.com. I will put a blog post together. The two photos are from Jantar Mantar in Jaipur, India. 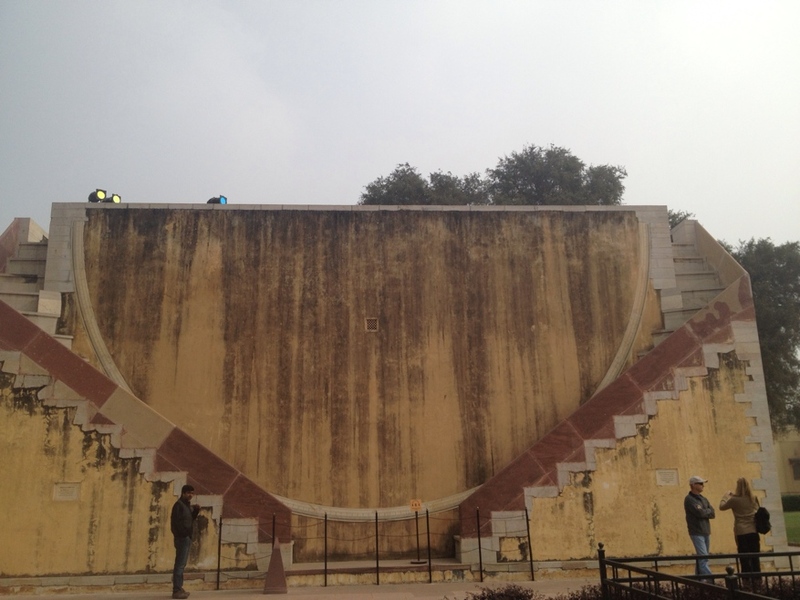 Jantar Mantar is an observatory that was built in the 18th century.